Im pretty sure it's the vent tube on the passenger side that is tapping around in there. I felt around and followed the tube as far as I could go in both directions. I looked for anything close enough to tap it while driving around. All my wires, etc. were secure inside the dash. I have no other rattles in the car. Last night I put in some rubber pieces. On the right side (when looking inside) of the cabin filter box, I found nothing that was close enough to cause any noise. In behind the cabin filter box, as the tube begins to turn upward...there was a smaller space. Im not sure if it was small enough...but I still wedged a small piece of rubber. Just up and slightly to the right from that point...towards the windshield there was 2 pieces that seemed to be very close to each other. I put another piece of rubber in there too. I went for a drive and it got rid of the rattle on the far right side....however the one almost in the middle part of the passenger side was still there. Today, I got in there again and followed the tube right to the windshield. As you get near the windshield, the tube begins to turn a bit. When it begins to turn, put your hand on the top part of the tube and continue. You will run into 3 protruding points that are ever so slightly touching the tube. These protruding points are molded with the dash cover. They stick downward towards the tube. I found some windshield foam and cut out 2 small pieces and folded them 3 ways and wedged it between the 3 protruding points and the tube. The 1st point may require another piece of folded foam to provide a secure fit as its slightly further away from the tube. I went out for a drive and went over all kinds of different pavement and am happy to say that I have NO RATTLES! Make sure all pieces put in place fit tightly. Last edited by prelude_guy97; 10-28-2008 at 04:44 PM. Im almost sure that the 3 protruding points caused the chattering rattle...the one in the middle part of the passenger side dash. After putting foam in place, when I tap on the surface...its quiet now. The foam pieces are in place good. This morning was cool and rainy...still no noise anywhere. I dont have any noise coming from the driver's area of the dash...but in case I get some in the future...what did you guys do in that area? How can you get access to behind the dash on the driver's side? Thanks and I hope my troubleshooting helps out with the passenger side dash rattles. I will try and get some pics tomorrow. It's getting a bit too dark here now. Im not sure how the pics will turn...its way up there! haha. It's pretty close to where the air vents out at the windshield. Ill see what I can do. As promised, here is the pic. This is behind the cabin filter box that you first see when opening the dash up. I took a pic of the 2 areas where I installed rubber pieces. I folded them 3 times so they would fit in there snug. They won't come out. I couldnt get a pic of where I installed the 2 layers of foam between the tube and the 3 protruding points. 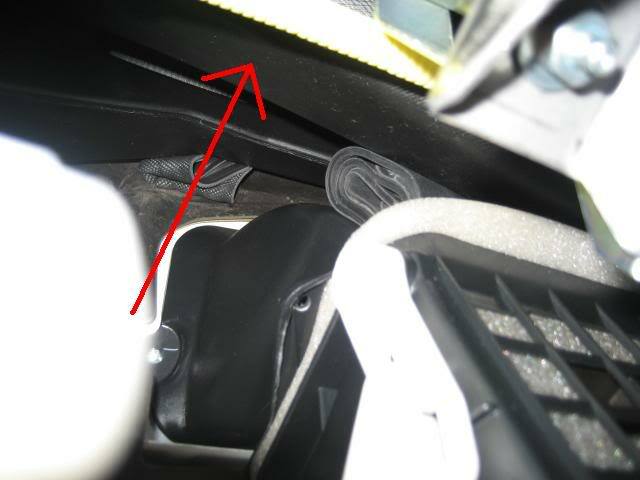 The red arrow in the following pic shows the tube to follow as you approach the windshield. If you sit on the door sill, you will be able to put your hand on the top part of that tube and go up. You'll feel these points near the top and you'll see why I wasnt able to snap a pic. haha. I folded a 1/2 inch foam piece so that it would fit tightly between the points and the tube. Last edited by prelude_guy97; 10-30-2008 at 03:58 PM. NP! I had an appt for tomorrow...but cancelled it and decided to troubleshoot myself. Ill let the site know if the infamous dash rattle returns. I don't even get those colder morning dash rattles anymore. The morning rattles were really annoying...those chattering ones in the middle passenger side. My dash is quieter now than the day I picked the car up. Most of my rattles came from the area where I applied the foam. The rubber pieces stopped the smaller rattle that was coming from the far corner on the passenger side. Im not sure if both rubber pieces are absorbing the corner rattle or just one...but im not touching either. Last edited by prelude_guy97; 10-31-2008 at 01:36 PM. With the weather change here in the midwest, I am now noticing the dash rattles when I get into the cold car in the morning! What an irritant! It's the sound of plastic rattling against plastic. I can't quite pinpoint where 2-3 noises are coming from, although it seems they're coming from somewhere around the dome above the speedometer. If anyone finds any cure, let me know! it is strange that i don't have a rattle? Do the repair suggested by the OP, and some of your rattles might go away. It doesn't bother me right now, so I'm not going to go to the trouble but later on, I might.